There is nothing more important to us than satisfying our customers’ needs, and that often involves convenience. That’s why we offer same day Shirt Laundry Service at our North Vancouver location. With this service you can drop off your shirts by 10 am and we will have them cleaned and ready for you to pick up on the same day. 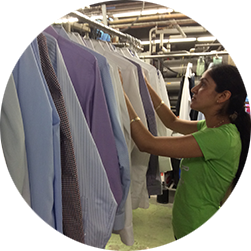 We process shirts on our premises to your preference, either with or without starch and on hangers or neatly folded. We do hand and custom finishing at your request. Our expert staff carefully inspects each shirt for stains and checks for buttons that need to be reinforced or replaced.